"The Encyclopedia of the Missing," my Longreads story about the woman behind America's largest database of missing people, was featured on Digg and Longform. 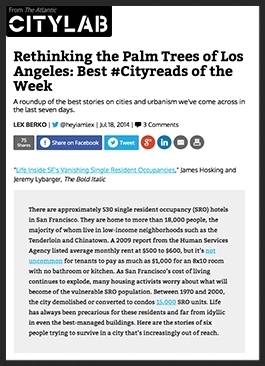 Longreads named my SF Weekly cover story "Psychic Capital " one of the top 5 reads of the week. The story was also picked up by New York magazine and Business Insider. CityLab named my essay about photographer W. Eugene Smith one of the best #cityreads of the week, and Feature Shoot included it in a roundup of the week's best photography stories. I collaborated with photographer James Hosking to create a photo essay exploring medical marijuana in San Francisco. I interviewed four cannabis users—including a marijuana courier—to better understand the emotional and economic ramifications of the city's booming pot industry. Excerpts from the project were posted as part of James' takeover of Feature Shoot's Instagram. The Advocate chose Vladimir Putin as its person of the year in 2014, and I wrote the accompanying cover story that examined some of Russia's more egregious human rights abuses. The story—and the provocative cover art—sparked a lot of controversy. Post by Dazed and Confused Magazine. My cover story for The Advocate's September/October issue investigated corporate America's efforts to export equality programs abroad. I talked to reps from the US State Department's Global Equality Fund, along with activists and business leaders, asking all of them the same question: Will money drive equality worldwide? For Out's September issue, I profiled three aging drag performers in San Francisco's gritty Tenderloin neighborhood. I also collaborated with filmmaker James Hosking to produce a 28-minute documentary, Beautiful by Night, that further explored the lives of our protagonists. Out named my article one of the best longreads of 2014. @jeremylybarger @outmagazine loved it. Bookmarking, sharing... #donnapersonna is gold! I covered a drag coronation in Reno for the British magazine Dazed & Confused. 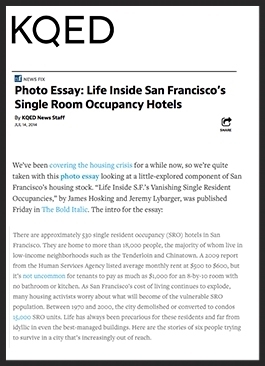 I spent a month interviewing people who live in San Francisco's residential hotels. Six of these profiles were published on The Bold Italic, an online magazine covering San Francisco news and culture. CityLab chose the story as one of the best reads of the week, and KQED—Northern California's PBS affiliate—featured the piece on their blog. My cover story for The Advocate's April/May issue examined San Francisco's ambitious—and some say unrealistic—plan to become America's first AIDS-free city. Matthew Breen, the magazine's editor-in-chief, appeared on Truthdig Radio to discuss the story. Out magazine chose my essay about outsider artist Henry Darger as one of the top ten longreads of 2013. I talked with Fred Ritchin about the fate of photojournalism in the age of Instagram—a subject that proved surprisingly resonant among both professional and amateur documentarians. "What does a professional photojournalist do that others cannot?" http://t.co/oM4ggMc9l4 That's the right question, at least. Recommended. Good read, worth your time, etc. I know I found it interesting as both a gatherer and consumer of news. I interviewed Alexander Perlman about his documentary Lot Lizard—an often harrowing portrait of truck stop prostitution. The interview was featured on Digg's homepage and garnered shout-outs from around the web. I interviewed Oscar-winning director Roger Ross Williams about his documentary God Loves Uganda. I wrote a long essay about Sonallah Ibrahim's Egyptian modernist novel That Smell for The Los Angeles Review of Books.